A special blog post from Victory Guide’s CEO Julie Palakovich Carr. As a three time candidate for office and local elected official, I've personally knocked on close to 20,000 doors in the past five years. In that time, I've fine-tuned what I bring with me to go door knocking. Here’s my go to list of accessories that make door knocking easier. A portable charger for recharging your phone on the go. If you haven’t used one of these devices before, it’s a game changer. You can go out canvassing all day and not worry about your phone battery dying. I have an Android phone and used this model, but similar devices exist for iPhones. The best portable battery will hold enough charge to fully recharge your phone and will be small enough to fit into your pocket. A non-sweating water bottle. Everyone enjoys a cold drink of water while you’re out knocking doors, but no one appreciates their literature getting soggy from the water droplets on the outside of a water bottle. This water bottle has double insulation to keep your water cold and prevents condensation on the exterior of the bottle. Even in the hottest weather I was able to keep this bottle in the same bag as my lit without any problems. A useful and stylish bag to hold your things while canvassing. I’m a fan of carrying a canvass bag to hold my literature, a water bottle, my car keys, and my phone while I knock doors. I’ve used a variety of styles of bags over the years, but my favorite bags have had a pocket on the outside where I can easily access my phone. (I like to put my phone in the pocket before I ring a door bell and then pull it back out while I’m walking away from the house to enter notes into Victory Guide and to see what the next house is to knock.) I’m still looking for the perfect bag: one that has an external pocket and a separate pen holder that isn’t in the pocket so that your phone screen won’t get scratched. Clicker sharpies to write “sorry I missed you” on your campaign literature. This is a must for candidates. I even advise people to design their canvassing literature so that there is a small space to write “Sorry I missed you! [Your Name]” on the card. Depending on the finish of your lit (glossy vs. matte), different types of writing utensils work better. If a permanent marker is smearing, try a regular pen that opens/closes with a click rather than a cap. Not dealing with a marker or pen cap will save you time at the doors. Comfortable shoes. I’ve worn through countless pairs of shoes during my three campaigns. Some shoes have held up better than others and some pairs were more comfortable than others. My go to shoes for my 2018 campaign are from a British comfort shoe company: Hotter. The name is pretty ironic, because it’s clear that the brand’s core demographic is senior citizens. But they do carry a few stylish options for younger customers. I wore these shoes a lot; they held up through miles and miles of knocking and plenty of rain and even some mud. As the weather gets colder, I always felt that the most miserable part of knocking was how cold my hands would get. I’ve tried several pairs of gloves that are supposed to work on a smartphone, but didn’t have much success. So I settled on fingerless gloves; they don’t keep your hand completely warm, but it’s better than nothing. On especially cold days or when you are standing at the polls for 14 hours on Election Day, hand warmers are useful. Victory Guide. I’ve won all three of my races using Victory Guide. It made it easy for me to know which voters to talk to and to track the progress of my campaign. I simply opened the Victory Guide app and could start knocking doors in whatever neighborhood I felt like—all without the need to cut turf or to create paper walk sheets. Getting a list of the registered voters in your district is one of the essential things that every political campaign needs to do. Without a voter file, you can't target the right voters. There are a variety of options of where to obtain a voter roll, including your city/county/state government or a commercial data vendor. Regardless of where you get the data from, be sure to request the voting history for each registered voter for at least the last three comparable elections. For instance, if you are running for city council in 2019 and elections for this office are held every two years, you would want the voter history data for 2017, 2015, and 2013. Although these records don't tell you how a voter voted--the ballot is secret after all--this information is vital in determining which registered voters actually vote. That's especially important since only roughly 40% of registered voters vote in mid-term elections (e.g. 2018) and the turnout is even lower for primaries, special elections, and odd-year municipal elections. For instance, turnout of 20% or less is not usual for local elections. Many candidates who are running for local office may think of going to the government entity that manages voter registration and elections in their jurisdiction. Whether it's the city clerk, Secretary of State, or county Board of Elections, these government agencies are usually required to make voter information available to political campaigns, usually for a small fee. The file is usually low cost; some agencies charge as little as $2, although $25-$100 is more typical. It's usually fairly easy to get a copy of the voter file, so long as you are able to go in person during business hours to request and pick up the file. This is usually the most up-to-date file option since these government entities maintain the official voter lists. Most jurisdictions will update the voter list once a month to reflect new registrations and removal of voters who moved away or died, although the frequency of updates varies by jurisdiction. You may receive a physical CD with the data on it, so you'll need a CD-drive on your computer to read it. The files may be in a format that is difficult to work with or analyze, such as a PDF. Alternately, if an Excel file is provided, it may contain so much data that you can't work with it in Excel, as the software has a maximum limit on the number of rows of data. Older versions of Excel have a maximum of 65,536 rows; if you see this exact number of rows in the file you should check to make sure that it is the full data set and that it was not truncated by Excel. Some useful types of data may not be included, such as voter gender, date of birth, or voting history. Additionally, some jurisdictions do not collect phone numbers as part of voter registration or may not release voter phone numbers to candidates. Be sure to check the file before you leave the Board of Elections office to ensure that it contains all of the information you requested. Frequently some requested field is left out. This may be your best option if you don't have free or subsidized access to VAN (see the next section) and you need to get the file fast. VAN is a voter data service available only to Democratic candidates. Access to the platform is controlled by your state's Democratic Party. Voter information is standardized and contains all of the fields of information that a campaign may need, including voter phone numbers. Plus the data is automatically updated periodically. Some state parties allow candidates to access proprietary data, such as predictive modeling scores about voters' likelihood of voting for Democrats. Not all states, however, allow this information to be shared with candidates. The VoteBuilder platform provides tools to search and filter the voter list, so it's possible to create a highly customized list of voters to target. Because each state party controls access to VAN, they can decide which candidates get access. So if you are running for a non-partisan office, you may not be able to get access. Moreover, there have been cases reported in the media of Democratic candidates being denied access to VAN by their state party. The price for VAN access varies dramatically from state to state. In some states, access to VAN is highly subsidized by the state party, but in other states, it can cost thousands of dollars--far exceeding the budget for small campaigns. Lastly, VoteBuilder is a powerful platform. Because it can do so much, there is a learning curve. Many users report needing significant training before they can use it on their own. NationBuilder offers a free option for any candidate, elected official, or political advocacy organization to get a voter file. It's free and convenient! You can request your file online by filling out a short form and receive a digital copy of the voter file in .csv format. It takes about a week to receive your file. You can only get one voter file per primary and general election cycle. You cannot receive any subsequent voter updates, such as newly registered voters. In a handful of cases, we've seen voter files that were missing the most recent election cycle. In most cases, however, the files are reasonably up to date. This may be your best option if NationBuilder can provide you with an up-to-date voter file and you don't mind waiting a week. Several commercial data vendors offer voter data for a modest fee. TargetSmart, L2, and Catalist are a few examples of these firms. The data is standardized, complete, and relatively up to date. These vendors often have more up to date phone numbers for voters, including cell phone numbers. It's also possible to purchase only phone numbers and/or email addresses to supplement the voter file that you obtained from another source. Although vendors only charge a few cents per voter record, these costs can add up quickly, even for a small campaign. This may be your best option if you want the most accurate phone numbers for voters and don't mind paying extra to get them. Once you have a voter file, you need a way for your campaign to identify and reach your target voters. Victory Guide is a one-stop-shop for Democratic, progressive, and left-of-center candidates to run winning campaigns for local, county, or state legislative office. The Victory Guide mobile app to make voter outreach easy through door knocking and phone banking. The app shows exactly what doors to knock and which voters to talk to, and allows you to take notes on each conversation. Notably, Victory Guide works with all of the above data sources. As a new customer with Victory Guide, we take care of importing your voter file into our system and creating a target universe of voters who meet your specifications, such as a certain party affiliations or voting frequency. We then map all of that data into our canvassing app so that you can easily knock on the doors of your target voters. You can monitor your voter outreach progress from your campaign's dashboard. Schedule your personal demo of Victory Guide. 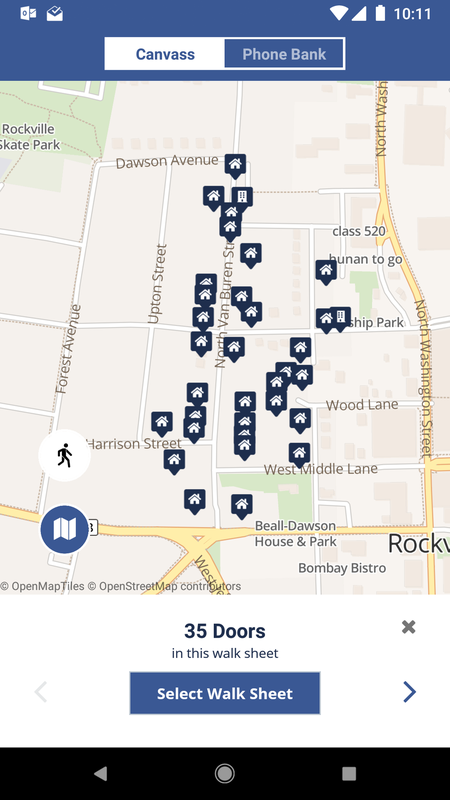 We're delighted to announce a major new feature in Victory Guide: the ability for a canvasser to pick their own walk sheet in the area of their choice. It's like being able to cut turf on the fly from within the Victory Guide app. A user simply pans to the part of the district that they want to knock in and taps the smart walk sheet button. The system will recommend clusters of doors in that area that are actually walkable--no crossing busy roads or impassable barriers like waterways. If the user doesn't like the first walk sheet that was recommended, they can preview other walk sheets in that area. Each smart walk sheet is customized to the canvassing schedule of the user. If a user is scheduled to knock for 1 hour that day they will see a smaller walk sheet than someone who is scheduled to knock for more time. As always, doors that have already been knocked by the campaign won't be included in a walk sheet nor will doors that another canvasser selected for the day. Want to see smart walk sheets in action? Contact us for a demo. Your campaign is ready to make the leap and to hire paid campaign staff. Whether you are making your first hire or staffing up your campaign, here are some resources to help you. The first step is deciding what help your campaign currently needs or will need down the road. Ideally, you should be looking to fill a core campaign need(s) with the person you hire. What are the duties that you as a candidate are struggling with? Is it formulating campaign strategy? Is it staying on track for fundraising? Whatever it is that you need help with, make a list to include in the job description. Check out this example of a job description for a campaign manager. Be aware that prior campaign experience is helpful, but not always necessary. Finding someone who is enthusiastic, self-motivated, and eager to take on new tasks is just as important, if not more so. As a candidate for elected office, it can be overwhelming to try to figure out how to best reach voters. Should you spend your time knocking on doors or calling voters? Is attending community events worthwhile? Maybe it’s better to focus on fundraising and to spend the money on direct mail? You may also be getting conflicting advice from your campaign advisors, from other people who have run for office, and from vendors. Each person has their “war story” of how they won an election using some particular tactic. But how do you know what strategy really works? You’ve decided to run for office. Congratulations! But now what do you? One of the first steps you should take is to research the rules, regulations, and laws that govern elections in your jurisdiction. The best place to start is with the Board of Elections or City Clerk, County Clerk, or State (depending on what level of government you are running for). Take a look at their website or give them a call. They likely have a resource packet for candidates. What paperwork do I need to complete to officially file as a candidate?